Geometric Knitting Patterns by Tina Barrett. Barron's Educational Series. Geometric designs are a classic way to add interest to just about anything, from a painted wall to a mosaic to a knitting design. With the aid of computer charting programs and a keen imagination, a knitter can come up with all sorts of designs that could be used in knitting projects. 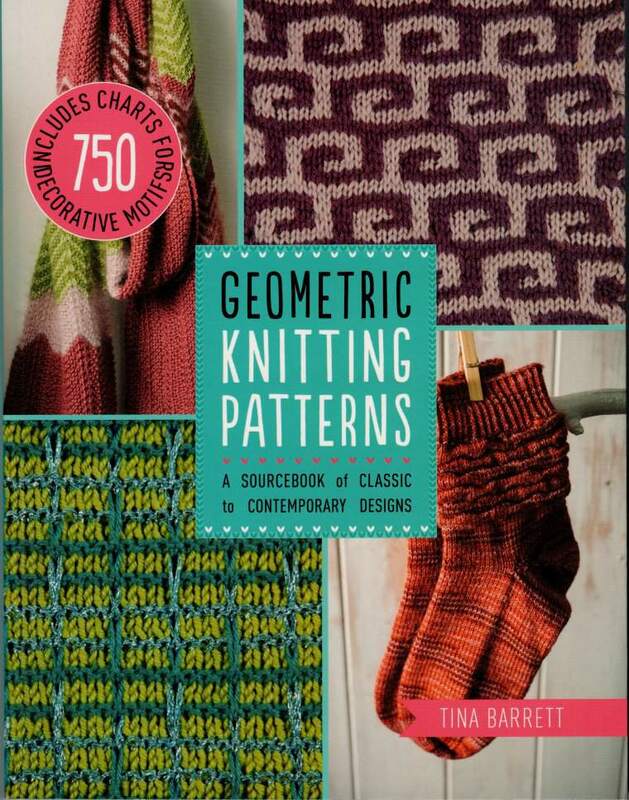 That's just what Tina Barrett did to develop her book Geometric Knitting Patterns: A Sourcebook of Classic to Contemporary Designs. The book includes color charts for 750 different designs, from stripes and chevrons to squares, checks, hearts, Fair Isle designs, abstract patterns and much more. Within each chapter, there are several sections. For instance manipulated fabrics covers things like slipping stitches, mosaic patterns, wrapped stitches, knitting in the row below, bobbles, cables, twist stitches and lace. Each chapter also includes a pattern that uses a stitch from the chapter or is inspired by the techniques. For example, the chapter on tessellating patterns has a hexagon floor mat as the project, but all the charts are rectangles. There are socks with a pintucked cuff, a plaid pet bed, and several other fun projects. The book includes a wide variety of patterns shown in lots of different colors, which is inspiring. But only one swatch on each page (there are usually at least four on a page) is actually knit, and sometimes it's hard to imagine how the designs will translate into knitting. I know it would have been an insane undertaking to knit all 750 swatches, not to mention making an already large book much bigger, but I'd still like to see more of them in knit form if for no other reason than I think some of them really would not work well knit. And the swatches that are shown do not show the full chart in knit form, so there's still a little guesswork going on even then. If you love color knitting and exploring different kinds of motifs in different ways, this is a really fun and inspiring book, especially if you're comfortable with adding motifs or all over designs to projects that might have been written as plain Stockinette or other basic stitch patterns. If you're someone who wants a lot of guidance, or who wants to know exactly what a design is going to look like knit up before you start knitting it, this is not the book for you. But if you're comfortable reading charts, working with a lot of colors and going your own way on designing projects, this book should provide you with a lot of great ideas to try.